Cedar siding looks very attractive but when there are many holes being drilled daily it can get to be unsightly and annoying. The culprit is most likely a woodpecker and they can be more or less active depending on the time of year. Sometimes hanging shiny objects can deter them and motion sensor deterrents. Sometimes the birds will move on. If damage keeps occurring over and over with deterrents in place then there is a permit option with the government to trap and remove woodpecker. Patching holes with foam and putty is important to keep up with as small sparrows will move in the holes made and nest causing more problems and potential for mites. 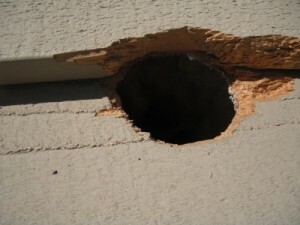 Wildlife & Waterfowl Solutions LLC will patch woodpecker holes and install deterrent/removal methods for woodpeckers.